What does a sample NYC home inspection report look like? Is it necessary to even do an inspection if you’re buying a condo or a co-op apartment? How long is the report and how much time does an inspection take? A home inspection is a must if you are purchasing free-standing real property such as townhouses, multi-family and detached or semi-attached houses. 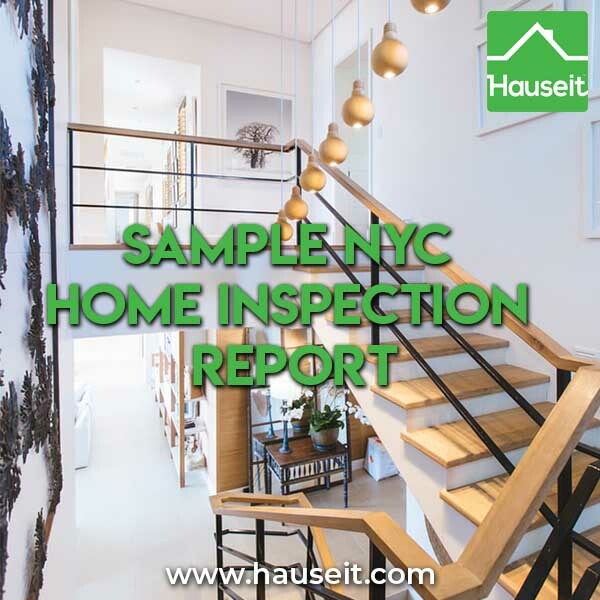 As you’ll be able to see from the sample NYC home inspection report below, a good inspector will be able to test for things like mold, hidden cracks in exposed piping, asbestos and any leaks in your roof. Furthermore, a home inspection is a great opportunity for you to take a couple hours to learn more about your home and how to maintain it properly. If you are buying a condo or co-op apartment in NYC however, it isn’t as common to demand a home inspection unless you are buying new construction. Home inspections are especially uncommon if you’re purchasing in a building with many units where the cost of maintaining common areas such as the roof and boilers are shared by many owners. Since you are only responsible for the maintenance of the interior of your apartment, the most an inspector can do in a inspection which you cannot yourself through a simple walk-through is to test for mold. Note: A NYC home inspection report can be important when purchasing new development condominiums from lesser known sponsors if you are unsure of their workmanship or if the apartment has its own boiler etc. It has been a pleasure to provide your inspection service and I truly appreciate your patronage. 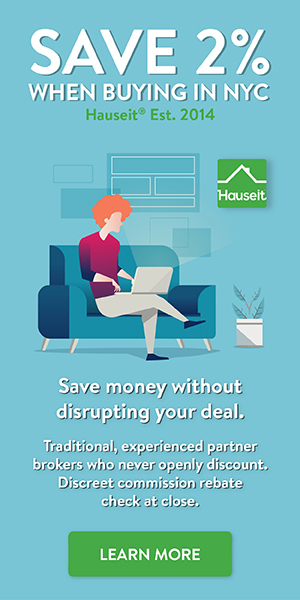 I worked hard to research your real estate investment and report back to you in a comprehensive way to answer all of your questions as thoroughly as possible. Remember that I have your best interests in mind throughout this process and I am happy to answer any questions that you might have about the inspection. Please feel free to call me directly with any of your questions. Unless otherwise noted, the intention of this inspection is to report on the condition of the your unit only, and not the building in its entirety. Any observations noted in common areas of the building are made at the discretion of the inspector, and are for your information only. While you do have a fiduciary interest in the general condition of the building and related components, your obligations and responsibilities in this regard are beyond the scope of a home inspection. You should consult with your attorney about any and all legal matters. Please note that homes are inspected within the context of the time period in which they were built, taking into account the generally-accepted building practices of that time period, and may not meet many generally-accepted current building standards.The Inspection Report will comment on unsafe conditions, but problems will be described as defects at the Inspector’s discretion. Homes are not required to be constantly upgraded to comply with newly-enacted building codes but are only required to comply with building codes or generally-accepted standards which existed at the time of original construction. The General Home Inspection is not a building code-compliance inspection, but an inspection for safety and system defects. The Inspection Report may comment on and identify as problems systems, components and/or conditions which may violate building codes, but confirmation of compliance with any building code or identification of any building code violation is not the goal of this Inspection Report and lies beyond the scope of the General Home Inspection. If you wish to ascertain the degree to which the home complies with any applicable building codes, you should schedule a code-compliance inspection. Maintenance (M) = This is a maintenance item. Information (I) = This is additional information pertaining to an item. (a) Home inspectors shall observe and report on readily accessible:1. Roofing materials and condition; 2. Roof drainage systems; 3. Flashing; 4. Skylights, chimneys and roof penetrations. (d) Home inspectors are not required to observe and report on: 1. Antennas, lightening arresters or similar attachments; 2. Any flue or chimney interior that is not readily accessible; 3. Other installed accessories. (f) Home inspectors are not required to determine the remaining life expectancy of roof coverings, manufacturers’ defects, installation methods or recalls or to determine the number of roof layers present. The roof above the apartment was pooling water in several areas. This can lead to moisture intrusion and premature deterioration of roofing materials. I recommend that a qualified roofing contractor evaluate and repair or correct as needed. Because cement tiles were installed on the terrace, the drains on the terrace for the subject unit were not visibly accessible. These drains (if any) should be made visibly and physically accessible for maintenance. Please note that the full inspection of the roof is beyond the scope of a general home inspection for unit in a co-op or condo, and conditions observed and reported on in this report are in no way meant to be inclusive of all issues that may exist in the building. In addition, you should check with your attorney and or building management to ascertain what your responsibility is for roofing repairs and maintenance. (a) Home inspectors shall observe and report on: 1. All exterior walls and coverings, flashing and trim; 2. All exterior doors including garage doors and operators; 3. All attached or adjacent decks, balconies, stoops, steps, porches and railings; 4. All eaves, soffits and fascias where accessible from the ground level; 5. All adjacent walkways, patios and driveways on the subject property; 6. The condition of a representative number of windows. (a) Home inspectors shall observe and report the following site conditions: 1. The building perimeter for land grade and water drainage directly adjacent to the foundation; 2. Trees and vegetation that adversely affect the residential building; 3. Walkways, steps, driveways, patios and retaining walls. (b) Home inspectors are not required to observe and report on the following site conditions: 1. Fences and privacy walls; 2. The health and condition of trees, shrubs and other vegetation. (c) Home inspectors are not required to observe and report on the following: 1. Screening, shutters, awnings and other seasonal accessories; 2. Fences; 3. Geological and/or soil conditions; 4. Recreational facilities; 5. Out-buildings other than garages and carports; 6. Tennis courts, jetted tubs, hot tubs, swimming pools, saunas and similar structures that would require specialized knowledge or test equipment; 7. Erosion control and earth stabilization measures; 8. The operation of security locks, devices or systems; 9. The presence of safety-type glass or the integrity of thermal window seals or damaged glass. Comments: Inspected The exterior of the home was inspected and reported on with the above information. While the inspector makes every effort to find all areas of concern, some areas can go unnoticed. Please be aware that the inspector has your best interest in mind. Any repair items mentioned in this report should be considered before purchase. It is recommended that qualified contractors be used in your further inspection or repair issues as it relates to the comments in this inspection report. (a). Home inspectors shall: 1. Observe and report on the material and general condition of walls, ceilings and floors; 2. Observe and report on steps, stairways and railings; 3. Observe, operate and report on garage doors, garage door safety devices and garage door operators; 4. Where visible and readily accessible, observe and report on the bath and/or kitchen vent fan ducting to determine if it exhausts to the exterior of the residential building; 5. Observe, operate and report on a representative number of primary windows and interior doors; 6. Observe and report on visible signs of water penetration. (b). Home inspectors are not required to: 1. Ignite fires in a fireplace or stove to determine the adequacy of draft, perform a chimney smoke test or observe any solid fuel device in use; 2. Evaluate the installation or adequacy of inserts, wood burning stoves or other modifications to a fireplace, stove or chimney; 3. Determine clearance to combustibles in concealed areas; 4. Observe and report on paint, wallpaper or other finish treatments; 5. Observe and report on window treatments; 6. Observe and report on central vacuum systems; 7. Observe and report on household appliances; 8. Observe and report on recreational facilities; 9. Observe and report on lifts, elevators, dumbwaiters or similar devices. General signs of wear and tear commensurate with the age and style of the building were observed at the time of inspection. (1) General signs of wear and tear commensurate with the age and style of the building were observed at the time of inspection. (2) Crowning was observed 0n the floor in the front bedroom. No signs of active moisture intrusion were observed at the time of inspection. Crowning: Crowning takes place when the edges of the wood shrink in towards the bottom while the middle or the top of the plank swells up past the rest of the regular level of the floor. It looks like a small roll sticking out above the rest of the flooring. This can either also be barely or very noticeable based on the situation. This happens when moisture is left sitting on top of the plank rather than the edges. • Outside of normal changes in the humidity levels during seasonal changes, moisture can remain underneath the floor or on top of the planks without the homeowner necessarily being aware that it’s happening. • A big spill could have taken place on the floor that was left unattended or not cleaned up after in a proper manner. • Moisture could be leaking up through subflooring. • A leaky pipe in the walls could be dripping down onto support beams that in turn lead to subflooring materials. • Dryer vents can become clogged and then different moisture levels unknowingly get pumped back into the house. (It’s common for homeowners to be unaware this has been happening especially if the homeowner often turns the dryer on but then leaves the home and comes back several hours later.) • Condensation near the bottom of uninsulated patio doors may accumulate near the edges of the floor. • There may be a leaky faucet or pipe under the sink. • A refrigerator or freezer may be not be working properly and leaking fluids slowly where the homeowner cannot see it. • In locations that receive a lot of rain, rain run off may not be properly diverted away from the exterior of the home allowing moisture to seep in underneath the home and therefore potentially into subflooring. Slow leaks could exist in roofing or in overhead sprinkler systems. 9 inch flooring tiles, possibly asbestos, were found in the closets. The only way to know for certain whether asbestos is in a particular product or material is to have testing performed by a licensed asbestos contractor. Screws employed to secure the upper kitchen cabinets to the wall appeared to be drywall screws. For safety reasons, I recommend that the cabinets be secured to the wall with fasteners designed for this use. Further evaluation and repair by a qualified contractor is recommended. (1) The seal between the thermally insulated glass panes in several windows has been compromised in the bathroom window and in 3 sashes in the rear bedroom. In order to correct the cloudy appearance of glass, a replacement of the glass pane or the unit will be necessary. A qualified contractor should inspect and repair as needed. (2) The right side bedroom window did not remain up when raised. This usually requires replacement of the window balances. I recommend that a qualified contractor evaluate and repair or correct as needed. (a) Home inspectors shall observe and report on the following visibly and readily accessible components, systems and conditions: 1. Interior water supply and distribution systems including fixtures and faucets; 2. Drain, waste and vent systems; 3. Water heating equipment and vents and pipes; 4. Fuel storage and fuel distribution systems and components; 5. Drainage sumps, sump pumps, ejector pumps and related piping; 6. Active leaks. (c) Home inspectors are not required to: 1. Operate any main, branch or fixture valve, except faucets, or to determine water temperature; 2. Observe and report on any system that is shut down or secured; 3. Observe and report on any plumbing component that is not readily accessible; 4. Observe and report on any exterior plumbing component or system or any underground drainage system; 5. Observe and report on fire sprinkler systems; 6. Evaluate the potability of any water supply; 7. Observe and report on water conditioning equipment including softener and filter systems; 8. Operate freestanding or built in appliances; 9. Observe and report on private water supply systems; 10. Test shower pans, tub and shower surrounds or enclosures for leakage; 11. Observe and report on gas supply system for materials, installation or leakage; 12. Evaluate the condition and operation of water wells and related pressure tanks and pumps; the quality or quantity of water from on-site water supplies or the condition and operation of onsite sewage disposal systems such as cesspools, septic tanks, drain fields, related underground piping, conduit, cisterns and equipment; 13. Observe, operate and report on fixtures and faucets if the flow end of the faucet is connected to an appliance; 14. Record the location of any visible fuel tank on the inspected property that is not within or directly adjacent to the structure; 15. Observe and report on any spas, saunas, hot-tubs or jetted tubs; 16. Observe and report on any solar water heating systems. (d). Home inspections shall describe the water supply, drain, waste and vent piping materials; the water heating equipment including capacity, and the energy source and the location of the main water and main fuel shut-off valves. In preparing a report, home inspectors shall determine whether the water supply and waste disposal systems are a public or private water supply. Handles were missing from shut off valves in the bathroom. Handles should be replaced to allow for easy access in case of emergencies or repairs. This is a small repair for a qualified plumber. The temperature of the hot water at the time of inspection was 132 degrees F. Temperatures above 120 degrees F are considered excessively hot and may be a safety hazard. While you may not have direct control of the hot water temperature of the building, I recommend that you consider consulting with a qualified plumber for possible solutions for this issue. (a). Home inspectors shall observe and report upon readily accessible and observable portions of: 1. Service drop; 2. Service entrance conductors, cables and raceways; 3. The main and branch circuit conductors for property over current protection and condition by visual observation after removal of the readily accessible main and sub electric panel covers; 4. Service grounding; 5. Interior components of service panels and sub-panels; 6. A representative number of installed lighting fixtures, switches and receptacles; 7. A representative number of ground fault circuit interrupters. (b). Home inspections shall describe readily accessible and observable portions of: 1. Amperage and voltage rating of the service; 2. The location of main dis-connects and sub-panels; 3. The presence of aluminum branch circuit wiring; 4. The presence or absence of smoke detectors and carbon monoxide detectors; 5. The general condition and type of visible branch circuit conductors that may constitute a hazard to the occupant or the residential building by reason of improper use or installation of electrical components. (c). Home inspectors are not required to: 1. Observe and report on remote control devices; 2. Observe and report on alarm systems and components; 3. Observe and report on low voltage wiring systems and components such as doorbells and intercoms; 4. Observe and report on ancillary wiring systems and components which are not a part of the primary electrical power distribution system; 5. Insert any tool, probe or testing device into the main or sub-panels; 6. Activate electrical systems or branch circuits which are not energized; 7. Operate overload protection devices; 8. Observe and report on low voltage relays, smoke and/or heat detectors, antennas, electrical de-icing tapes, lawn sprinkler wiring, swimming pool wiring or any system controlled by timers; 9. Move any object, furniture or appliance to gain access to any electrical component; 10. Test every switch, receptacle and fixture; 11. Remove switch and outlet cover plates; 12. Observe and report on electrical equipment not readily accessible; 13. Dismantle any electrical device or control; 14. Measure amperage, voltage or impedance; 15. Observe and report on any solar powered electrical component or any standby emergency generators or components. Gaps around the electric distribution panels in the hallway of the subject unit should be properly finished. In addition, the panel cover was not properly secured to the panel. I recommend that a qualified electrician evaluate and repair or correct as needed. (1) The outlets in the kitchen and on the right side living room wall (near window) were wired with the hot/ neutral wires reversed. This is a small repair for a qualified electrician. (2) Please note that the light fixture in the hallway did not operate at the time of inspection. While it is likely that this condition is due to faulty light bulbs, I recommend verifying that all light fixtures are functional prior to closing. (1) There were no GFCI (ground fault circuit interrupter) outlets in the kitchen of this apartment. For safety reasons, I suggest that GFCI outlets be installed within six feet of all wet locations like your kitchen, bathroom, laundry room, near the pools and garage. Basically, they should be installed any place where there might be a danger from moisture related electrical shock. All electrical work should be performed by a licensed electrician. (2) The GFCI outlets in the bathroom and front terrace did not trip when tested. Repair or replacement by a qualified electrician is needed. The main panel box is located in a hallway electric closet and there is a distribution panel in the hallway of the subject unit. The smoke detector in the hallway had been removed. Because smoke and CO detectors have limited useful life, I always recommend the purchasing and installation of new smoke/CO detectors when purchasing a home. The minimum standard as stated in the National Fire Prevention Association’s National Fire Alarm Code (NFPA 72): There should be a smoke detector on every level of the house, including the basement and outside every bedroom. Always install smoke detectors according to the manufacturer’s instructions. • If you sleep with your bedroom doors closed, it is recommended that a smoke detector be installed inside each bedroom. Alarms should also be installed in other areas of your home where people sleep. • Wired systems should not be connected to a circuit that could be turned off with a wall switch. Plug-in systems should have a restraining device at the outlet to prevent the plug from accidentally coming loose. • Hard-wired systems should be installed by a qualified electrician. Do not install the smoke/CO detector near windows, doors or forced-air registers where air flow would interfere with the operation of the detector. This home is apartment is powered by a 40 amp 240 volt electrical panel. Depending on your electrical demands, you may find this to be insufficient for modern energy demands. If this is the case, I recommend that you consult with a licensed electrician to discuss options and costs for upgrading the electrical system. 6. Observe and report on heating system accessories, such as humidifiers, air purifiers, motorized dampers and heat reclaimers; 7. Activate heating, heat pump systems or any other system when ambient temperatures or other circumstances are not conducive to safe operation or may damage the equipment; 8. Evaluate the type of material contained in insulation and/or wrapping of pipes, ducts, jackets and boilers; 9. Evaluate the capacity, adequacy or efficiency of a heating or cooling system; 10. Test or operate gas logs, built-in gas burning appliances, grills, stoves, space heaters or solar heating devices or systems; 11. Determine clearance to combustibles or adequacy of combustion air; 12. Test for gas leaks or carbon monoxide; 13. Observe and report on in-floor and in-ceiling radiant heating systems. (a). Home inspectors shall: 1. Observe, describe and report on the type of air conditioning equipment and air conditioning distribution system; 2. Operate the system using the thermostat; 3. Open a representative number of readily accessible and operable access panels provided by the manufacturer for routine homeowner maintenance; 4. Observe and report on the condition of normally operated controls and components of the system. (b). Home inspectors are not required to: 1. Activate or operate air conditioning systems that have been shut down; 2. Observe and report on gasfired refrigeration systems, evaporative coolers, or wall or window-mounted air conditioning units; 3. Check the pressure of the system coolant or determine the presence of leakage; 4. Evaluate the capacity, efficiency or adequacy of the system; 5. Operate equipment or systems if exterior temperature is below 65 degrees Fahrenheit or when other circumstances are not conducive to safe operation or may damage equipment; 6. Remove covers or panels that are not readily accessible or that are not part of routine homeowner maintenance; 7. Dismantle any equipment, controls or gauges; 8. Check the electrical current drawn by the unit; 9. Observe and report on electronic air filters. (a). Home inspectors shall: 1. Observe and report on visible and accessible system components; 2. Observe and report on visible and accessible chimneys and vents; 3. Observe and report on chimney caps; 4. Observe and report on fireplaces and solid fuel burning appliances; 5. Observe and report on chimneys; 6. Observe, operate and report on accessible fireplace dampers. (b). Home inspectors are not required to: 1. Observe and report on the interiors of flues or chimneys; 2. Observe and report on fire screens and doors; 3. Observe and report on automatic fuel feed devices; 4. Observe and report on mantles and fireplace surrounds; 5. Observe and report on combustion make-up air devices; 6. Observe and report on heat distribution assists; 7. Ignite or extinguish fires; 8. Determine draft characteristics; 9. Move fireplace inserts and stoves or firebox contents. The heating system was common to the building and was operational at the time of inspection. Although the radiator in the bathroom was turned on, it did not get warm at the time of inspection. (a). Home inspectors shall: 1. Observe, describe and report on insulation in accessible, visible unfinished spaces; 2. Observe, describe and report on ventilation of accessible attics and foundation areas; 3. Observe and report on mechanical ventilation systems in visible accessible areas. (b). Home inspectors are not required to: 1. Disturb insulation; 2. Operate mechanical ventilation systems when weather or other conditions are not conducive to safe operation or may damage the equipment. There were functioning windows in the kitchen and bathroom. (1) The dishwasher is loose and needs to be properly secured to the underside of countertop or cabinetry as per the manufacturer’s specifications or generally accepted safety practices. (2) A strap is needed on where the dishwasher exhaust hose connects to the trap under the kitchen sink to prevent the hose from coming loose. This is a small repair. There was no range hood installed in the kitchen of this property. For safety reasons, I recommend the installation of a range hood or appropriately sized over the range microwave oven by a qualified contractor. The microwave oven installed above the stove was not intended for that purpose and can be damaged by high heat from the stove/oven. Replacement by a properly installed range hood or microwave oven designed for use above a stove is recommended. – Seal or patch gaps and cracks to avoid damage from freezing moisture. Freezing moisture will enlarge cracks in concrete and asphalt. – Replace any missing exterior wall covering material. – The roof should be free of debris, which will hold moisture next to the roof covering material and hasten deterioration. – Be sure that downspouts route roof drainage away from the foundation. – In cold climates, downspouts which are connected to underground drains are subject to freeze problems in the fall and spring. – Keep the finish in good condition. Clear finishes may require maintenance as often as every year or two. -Monitor pipe fittings, boilers and water heaters for corrosion or leakage. Maintain major appliances as recommended by local professionals. – Have the system, including the cabinet, burners, blower and filter cleaned and adjusted on an appropriate schedule. You can determine what constitutes an appropriate schedule by consulting with a qualified heating contractor. – Moisture intrusion can cause damage to the home by effecting the ability of the soil to support the weight of the foundation and by creating conditions favorable to the growth of biological organisms such as mold fungus. Mold fungus will cause wood with which it comes into contact to decay and may create unhealthy conditions by increasing concentrations of mold spores in the indoor air of the home. Always watch for any signs of moisture intrusion and take steps to correct it immediately. (c). Home inspectors shall not be required to determine the presence or absence of any suspected hazardous substance including but not limited to, latent surface and/or subsurface volatile organic compounds, PCB=s, asbestos, urea formaldehyde insulation, toxins, carcinogens, diseases, wood destroying organisms, mold, hazardous plants, illicit drugs or drug making equipment, lead paint, noise or contaminants in soil, water, air quality, wet lands or any other environmental hazard. 1. Conditions of systems or components that are not readily accessible; 2. The remaining life expectancy of any system or component; 3. The strength, adequacy, effectiveness or efficiency of any system or component; 4. The causes of any condition or deficiency; 5. The methods, materials or costs of corrections; 6. The future condition of a system or component including, but not limited to, the failure of the system and/or components; 7. The suitability of the property for any specialized use; 8. The advisability of purchase of the property; 9. The presence of potentially hazardous plants or animals including, but not limited to, wood destroying organisms or diseases harmful to humans including molds or mold-like substances; 10. The presence of any environmental hazard including, but not limited to, toxins, carcinogens, noise, and contaminants in soil, water and air; 11. The effectiveness of any system installed or method utilized to control or remove suspected hazardous substances; 12. Operating costs of systems of components; 13. Acoustical properties of any system or component; 14. Soil conditions related to geo-technical or hydrologic specialties. (l). Home inspectors are not required to offer: 1. To perform work in any trade or profession other than home inspection; 2. Warranties or guarantees of any kind. (m). Home inspectors are not required to operate: 1. Any system or component that is shut down or otherwise inoperable; 2. Any system or component that does not respond to normal operating controls and shall not be required to dismantle any system or component, except as explicitly required by these Standards of Practice; 3. Shut off valves or manual stop valves; 4. Any system or component that, in the opinion of the home inspector, is dangerous to the home inspector or other persons, or will result in damage to the residential building, its systems or its components. (n). Home inspectors are not required to observe: 1. Concealed spaces or components or underground items including, but not limited to, underground storage tanks or other underground indications of their presence, whether abandoned or otherwise; 2. Items that have not been installed; 3. Installed decorative items; 4. Items that are not entered in accordance with subdivision 15 of this section; 5. Detached structures other than garages and carports.